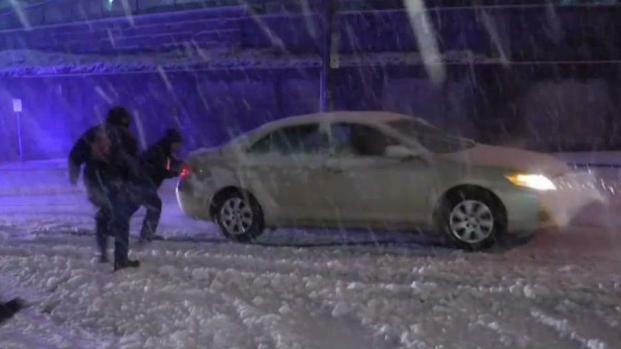 Heavy snow accumulation in central Massachusetts made for dangerous driving conditions. 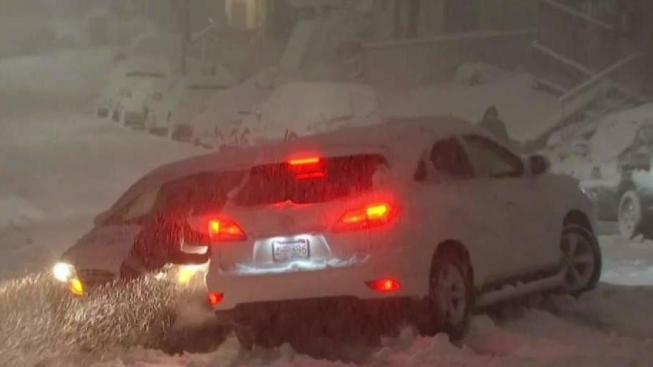 With heavy snow that fell overnight across New England, Massachusetts Gov. Charlie Baker announced Thursday that all offices for non-emergency state executive branch employees will be closed. A wintry mix of snow and light rain started falling before daybreak Wednesday in many areas, but the precipitation later turned to snow in most areas and continued to fall quickly and heavily overnight. "With several communities experiencing power outages and downed trees, the administration is urging residents to stay off roadways and to use public transportation when possible," according to a statement from Baker's office. As of 9 a.m. Thursday, more than 345,000 Massachusetts residents were without power. The snow is coming down across New England. The nor'easter just days earlier left hundreds of thousands in the dark in the Bay State. Crews rushed Tuesday to restore power to those remaining without it. The storm could dump up to 18 inches of snow in some areas. Damaging winds are forecast, with gusts of up to 60 mph on Cape Cod. Power outages and minor to moderate coastal flooding is also possible. Mayor Marty Walsh updated Boston's plans for the storm on Wednesday afternoon. "As always, safety is our number one priority. We are encouraging residents to stay off the roads, assist the elderly and disabled, and be sure to use caution during the cold weather," Walsh said. "Please remember to abide by safety guidelines, call 3-1-1 with any questions, and be safe." Boston Public Schools were closed on Thursday while all Boston Centers for Youth & Families community centers were open Thursday, 7:30 a.m. - 6:00 p.m., including stand-alone and school-based sites. City Hall and all libraries were open on Thursday and all employees should report to work. Central Massachuseetts is expecting at least a foot of snow by Thursday morning. Sidewalks should be shoveled by about 9:15 a.m. on Thursday. Speaking Wednesday morning, Baker urged residents who had to be out in the storm to be careful and plan ahead. "This storm is unique as it will create different weather challenges for every region of the Commonwealth," he said. "High snowfall totals in the Berkshires and Worcester hills, hazardous driving conditions in Central Mass., Western Mass. and all roadways starting at Route 128 and heading west, and a risk of scattered power outages and minor to moderate coastal flooding along the coastline. "Everyone should expect a long and challenging commute home this evening due to the rapid snowfall that will start this afternoon," Baker added. "Driving will become treacherous, and you need to plan ahead and be very careful." He said travel will be most difficult in the western and central parts of the state. Whiteout conditions are possible, with snow falling at 2 to 3 inches an hour in some areas. 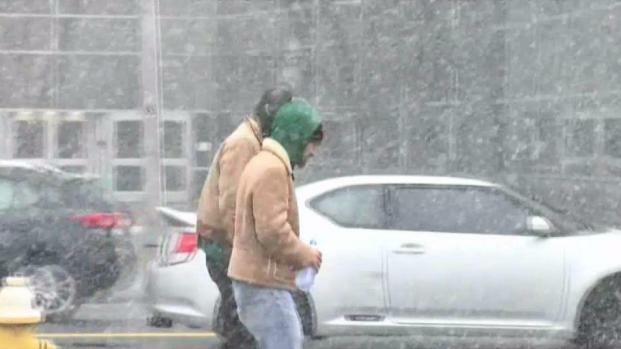 In Connecticut, nonessential state employees were being sent home from work early Wednesday ahead of the storm. In anticipation of the storm, the Massachusetts Department of Transportation announced Wednesday morning that crews were treating state roadways in the west and central regions. Highway Administrator Jonathan Gulliver said MassDOT will have 400 pieces of equipment on the roads to prepare for or clear snow and as many as 3,000 pieces of equipment on the roads at the height of the storm. "Plan your trip well ahead of time. If you do have to be out there, make sure you leave yourself plenty of time," Gulliver said. "It's going to be a very long commute tonight." New Hampshire officials are also urging motorists to avoid unnecessary travel. Officials with the MBTA are planning on running normal service on subway, commuter rail, and bus lines. However, the Mattapan Trolley line was replaced by shuttle bus service at 11 a.m.
Amtrak canceled some train service Wednesday, and many flights across the region were already been grounded. Wednesday's nor'easter is making commuting conditions difficult in the MetroWest area of Massachusetts. In Worcester County, where some of the highest snow totals are expected, residents are hoping it is the last winter storm of the season. "I have a huge tree still in my backyard, so now it's going to be covered with 12 inches of snow," said Kristina Rosa of Worcester. "Not looking forward to it." 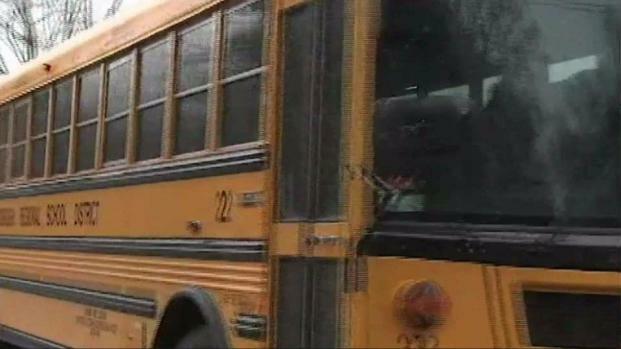 Schools were closed in Worcester and many businesses planned on shutting down early. "I think it's going to get thick in the early afternoon and everybody should get home before the traffic gets bad," said Marcos Mogcia, of Worcester. At the Department of Public Works, crews said they plan on working at least 18 hours. "Late snows tend to be on the warmer side and they tend to be wet and sticky heavy snow. 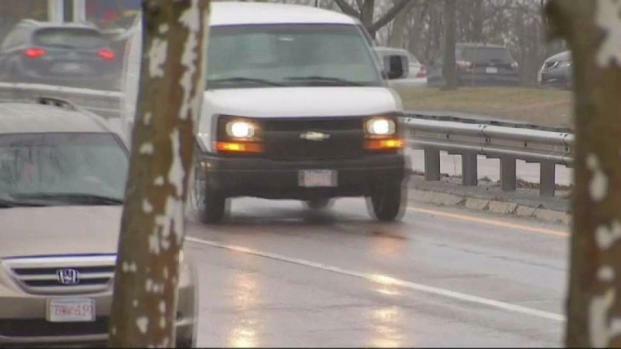 They're conditions that are more slippery for motorists," said Paul Moosey with the Worcester DPW. School districts in Massachusetts were closing early Wednesday in anticipation of the nor'easter, and many have already said they'll be closed Thursday. The National Weather Service has issued a winter storm warning that stretched from eastern Pennsylvania to most of New England from late Tuesday night into Thursday morning.